Hello Taylor! I just wanted to stop by and say Thank You for all of this great information about the history of Coupons, and to remind us to use them. I really learned a lot, and found the information to be very interesting! I am doing my best, as far as recording my info. regarding Store Coupons, Manufacturer Coupons, Store Sales, etc, and I feel that I am getting better at it! I found the article very interesting because I started using coupons when I was first married & expecting my first child in 1970. 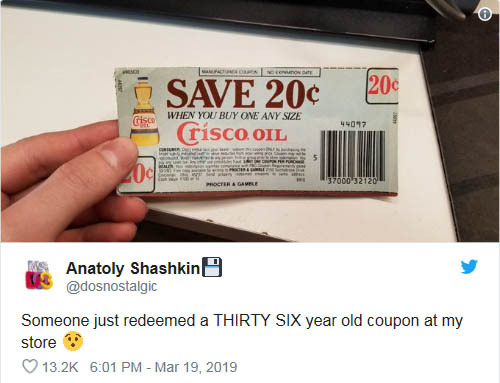 I’ve been a big user ever since and my friends always call me the coupon lady. I have many very old coupons also. Some may go back to the mid-80s. If it’s something I may buy, I’m holding on to the coupon. I have to admit I don’t know if some items are even made anymore. At one point, stores stopped accepting coupons without a barcode and I had to toss quite a few old ones. I have a couple of coupons from the 80s that my mom gave me that dont expire. The walmart in Bradenton, FL said they cant take printable coupons for groceries anymore cause they dont get reimbursed. That’s the 1st for walmart. It’s not even on their walmart.com that they dont take them. I enjoyed the story of coupons. Very informative. Thank you.